Checkweighers are used to dynamically check the accuracy of pack or product weights to ensure there are no underweights or overweights, by automatically rejecting these products. 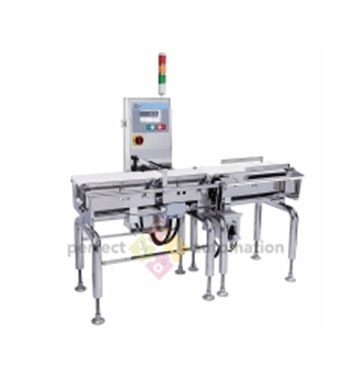 Combination Checkweigher/Metal Detector Units are designed to dynamically check the weights of the products and also allow products to be checked for foreign bodies. These Units are able to have a rejector system attached, allowing the removal of incorrect products. Metal Detectors have a high detection sensitivity system, allowing for the detection of both ferrous and non-ferrous metals. The addition of a rejector system automatically removes incorrect products from the production line. They can also be used in reverse to detect that a metal product is present when required. X-ray Inspection Systems can provide high level of product inspection to identify foreign bodies, even in aluminum packed products, such as hard rubber seals, metal, glass and stone by rejecting contaminated products. The X-ray Inspection Systems can also be used to detect missing products. 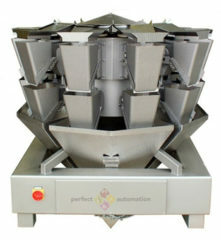 Multi-head Weighers provide a high accuracy method of weighing out loose products for Pouch Machines, Vertical Form Fill & Seal Machines, Horizontal Form Fill & Seal Machines, Tub and Tray Sealing Machines while operating at speeds of up to 540 cycles per minute. The Heavy Weight Checkweigher has high weighing capacity and a high accuracy digital filter to provide the exact product weight. It is controlled by a TFT colour LCD touchscreen and uses icon display for easy operation. The Checkweigher System uses DSP 32bit for high speed processing and an optimal FIR filter to remove vibration. 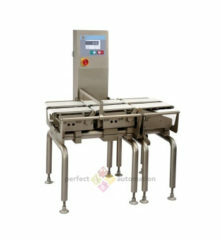 The Heavy Weight Checkweigher has a stainless steel construction and is IP 64 protected for easy cleaning and maintenance. The Checkweigher uses high accuracy digital filter to give the exact product weight. It is controlled by a TFT colour LCD touchscreen and uses icons for easy operation. The Checkweigher System uses DSP 32bit for high speed processing and an optimal FIR filter to remove vibration. 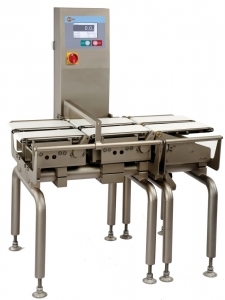 The Checkweigher has a stainless steel construction and is IP 64 protected for easy cleaning and maintenance. 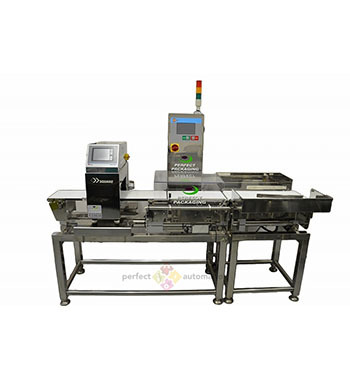 The Checkweigher uses high accuracy digital filter to give the exact product weight. The INT910MU-L210 is a multi-lane Checkweigher that is controlled by a TFT colour LCD touchscreen and uses icons for easy operation. 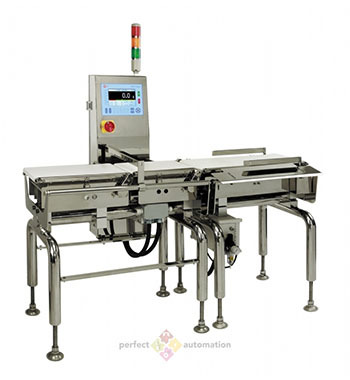 The Checkweigher has a stainless steel construction and is IP 64 protected for easy cleaning and maintenance. 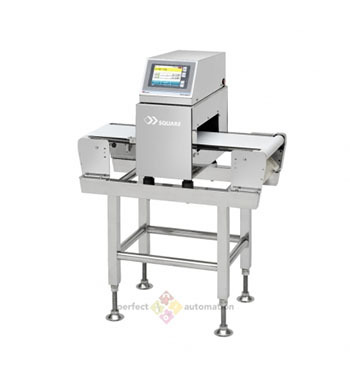 The Checkweigher/Metal Detector Combination Unit has been designed to allow for detection of foreign bodies and incorrect product weight. The Combination Unit runs off seperate touchscreen interfaces and is easy to clean and maintain. The Combination Units are also enabled to have a rejector system attached, allowing for removal of incorrect products. The SD3 series Metal Detectors use simple operational features for high detection of foreign bodies. The SD3 Metal Detectors includes a large colour LCD touchscreen for easy operation and displays illustrations for functionality. The Metal Detectors also allow for restricted access to prevent accidental setting changes. The Metal Detectors incorporate 2-frequency inspection technologies, making it possible to detect two kinds of foreign bodies, ferrous and nonferrous. This machine incorporates a sorting machine and has a user-friendly colour LCD touchscreen with illustration display for functionality. It also uses a 2-frequency inspection system that makes it possible to detect two kinds of foreign bodies, ferrous and nonferrous. 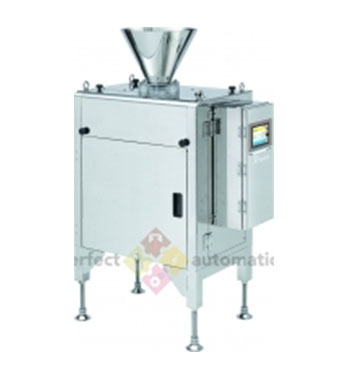 The Multi-head Weighers provide a high accuracy method of weighing out loose products for Pouch Machines, Vertical Form Fill & Seal Machines, Horizontal Form Fill & Seal Machines, Tub and Tray Sealing Machines while operating at speeds of up to 540 cycles per minute. 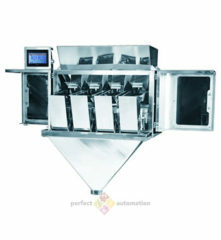 The Weigher is used for weighing of loose products through 4 hoppers. This machine is stainless steel in construction for easy cleaning and maintenance and is operated through a user-friendly Weinview colour touchscreen interface. The Linear Weigher has an innovative plug-in motor drive board, helping this machine to be maintained at low costs.